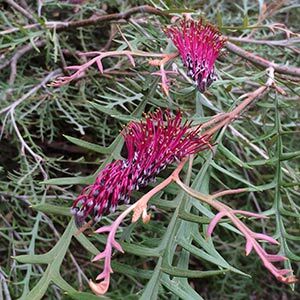 With very attractive vibrant purple to burgundy flowers Grevillea ‘Simply Sarah’ makes an excellent garden plant. It grows well in full sun and will cope with a little afternoon shade. Flowering can be limited in deep shade. Flowers are a good size reaching up t0 10 cm in length. Foliage is a mid green, pinnately divided with new foliage having a pink tinge to it. Flowers are either in clusters or solitary and are typical ‘Toothbrush’ type. The plant itself is naturally compact spreading and with good density to the foliage. This is a hybrid using G. beadleana and G. longifolia, developed in Queensland around 1995. This is very attractive plant in flower, however it does require excellent drainage. We suggest planting in a garden bed that has been raised to around 40cm. This will provide the drainage it needs. In soils that are already free draining we still suggest this practice. Regular pruning from a young age will ensure a good bushy habit. This is more effective that hard pruning later on. Fertilise with a general purpose native plant fertiliser in spring. Mulch lightly around the plant to maintain a cool root run. Height – To 2m however often pruned to 1m. Position – Full sun to a little light shade. Growth rate – Medium, depending on soil and climate. Foliage – Attractive mid green, new foliage with a pink tinge.